The final season of the long running and widely popular sitcom, The Big Bang Theory kicks off in a little over a week on September 24, exactly 11 years after it originally debuted on CBS. This got me thinking about one of the more interesting opportunities I’ve had with this blog, a chance to interview TBBT star Mayim Bialik. At that time, I was still working as a high school math teacher, the blog was a little over a year old, and as happens from time to time, I got an email from Texas Instruments PR team. They explained that in a few days, they’d be introducing Mayim as their new spokesperson. Would I like to interview her? My first thought was, “Absolutely!” quickly followed by, “How do I interview someone like that?” I occasionally do interviews for Tech Powered Math, but almost exclusively via email and certainly not with celebrities. This was going to be a different experience. My wife and I quickly made plans to travel to Chicago for the weekend, so I could cover as much of the T3 conference where Mayim would be introduced as possible. Honestly, as someone who came of age in the 90’s, I knew Mayim better from Blossom than TBBT, so I quickly watched through her first season with the show on DVD. I also tried to work through a handful of reasonably intelligent questions that I thought we be of interest to readers/viewers. Knowing that this would be an interview that would be concluded in less than 10 minutes, and I’m far from a journalist, I tried to keep it to just a few on point questions. As for the interview itself, I can’t say enough about how great Mayim was. As I think is obvious in the video, she was far more comfortable in the situation than I was, but that’s not just an “on camera” thing that she is doing. She and her publicist and I along with a handful of Texas Instruments reps were probably together for 30 minutes or so, and she was very friendly and engaging throughout. I’m sure it was a very tiring week for her with a lot of appearances throughout the conference, but she never for one second gave me the impression that she felt put upon or that an interview for my little blog was a waste of her time. I was nervous that I’d completely flub this opportunity: that I’d blow the questions, that my cheap camera equipment would fail (I had my phone recording audio as a backup), or that logistics would somehow interfere, and yet, it all worked out. So if by any chance she ever comes across this, thank you Mayim, for a memorable interview that has truly stuck with me in the years that have followed. I’m honored to have had the chance to meet you and will continue to follow your work in the years to come. 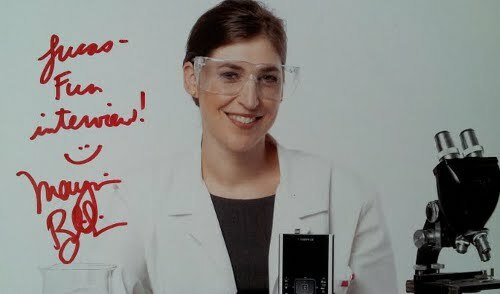 On Friday, Mayim Bialik, star of the CBS hit comedy, “The Big Bang Theory,” was introduced as a spokesperson for Texas Instruments calculators. Bialik is a perfect choice for TI. Many fans are probably unaware that when she finished work on the popular NBC sitcom “Blossom” in mid-90’s, she began life as a full time college student at UCLA, where she earned multiple college degrees. Among them is a Ph.D. in neuroscience, the same degree her Big Bang Theory counterpart, Amy Farrah Fowler, holds. Bialik was present at many events at through this weekend’s T3 convention, Texas Instruments’ annual showcase of educational technology and instruction, held this year in Chicago. Having attended several of those events, I can say that the teachers at the convention were uniformly excited to have her in attendance and hear what she had to say. On Saturday, I had the opportunity to interview Bialik about education, The Big Bang Theory, and Texas Instruments calculators. Her genuine passion for math and science education clearly came through as she talked about her own educational experiences, from her first graphing calculator (a TI-81 that she still owns) to obtaining a Ph.D. to passing along her love of science to her own children. Video of my complete interview follows below.